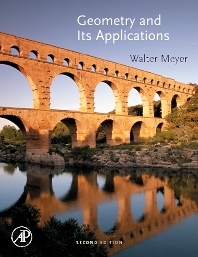 Meyer's Geometry and Its Applications, Second Edition, combines traditional geometry with current ideas to present a modern approach that is grounded in real-world applications. It balances the deductive approach with discovery learning, and introduces axiomatic, Euclidean geometry, non-Euclidean geometry, and transformational geometry. The text integrates applications and examples throughout and includes historical notes in many chapters. The Second Edition of Geometry and Its Applications is a significant text for any college or university that focuses on geometry's usefulness in other disciplines. It is especially appropriate for engineering and science majors, as well as future mathematics teachers. Walter Meyer received his Ph.D. at the University of Wisconsin in 1969. He is currently a professor at Adelphi University, and visiting professor at West Point Military Academy. He has industrial experience as head of robotics research at Grumman Data Systems. He is editor of Principles and Practice of Mathematics, as well as a contributing author to For All Practical Purposes. Adelphi University, Garden City, New York, U.S.A.
"OK, I’ll admit it. I didn’t think I was going to like this book. But it surprised me. It is, in my opinion, just the sort of thing its intended audience needs, and quite well executed. Most American mathematics departments offer a regular course in geometry, usually aimed mostly at future teachers. Given that students now arrive in college with very little geometrical knowledge, these courses have settled on a fairly standard pattern. First, one does a little synthetic geometry, following Euclid as modified by Hilbert, in more or less detail and at varying levels of rigor. Next comes some (still synthetic) non-Euclidean geometry, usually very lightly done. At that point, coordinates, vectors, and transformations can come in, which creates the opportunity to introduce various other kinds of geometry (especially projective) and/or to spend some time considering symmetries of the plane and related topics (Meyer does the latter). From there on, one is free to consider special topics; Meyer chooses to do a little bit of the theory of polyhedra. All this is fairly standard, as is the provision, made through a web site, of software support (in this case, using Geometer’s Sketchpad). What makes Meyer’s book stand out are two things. First, he puts to good use his experience in industry (at Grumman Corporation, where he ran a robotics research program) in order to present applications that, while usually simple, seem real. This includes some fairly important (and non-classical) material, such as a discussion of Voronoi diagrams. The second is harder to pin down; I’d describe it as the book’s “voice”: a humane, intelligent, reflective way of discussing things that is quite interesting to read. Read his discussion of what axioms are, early in the first chapter, to see what I mean. If we can get students to read the book and think about what they read, they’ll learn a lot from this book.